Cove Point Lighthouse – Chesapeake Chapter U.S.L.H.S. Cove Point Lighthouse is located in Calvert County along the western shore of the Chesapeake Bay four miles north of the mouth of the Patuxent River. The lighthouse was built in 1828 to mark the shoal that extends outwards from the scenic point of land toward the shipping channel in the Bay. The tower is 38 feet tall and was built by the lighthouse builder John Donohoo, who also built the Concord Point Light. The station initially featured the conical tower and a detached 1 ½ story keeper’s house. The light tower and keeper’s house were constructed of locally manufactured brick. The tower possesses a winding staircase to the lantern room and gallery. A fog bell building was added in 1837. The lighthouse was originally lighted with oil lamps and reflectors as the light source. In 1855 a fifth-order Fresnel lens was installed and then upgraded in 1857 with a fourth-order Fresnel lens. In 1928 the fuel source was converted from kerosene to electricity. The light is visible for 12 nautical miles. The keeper’s house was expanded several times. In 1883 a full second floor was added and in 1925 a large dormer was provided on top for another half story. The enlarged structure was divided into two apartments for keeper and assistant keeper and families. In the 1950s a small two-bedroom house was built for a third keeper. During this addition an office building was added. Over the years several changes occurred with the fog signal. In 1858 the bell apparatus was replaced with a clock-work mechanism. The current bell shed was built in 1901 to house an engine powered Daboll trumpet fog horn. The bell was mounted on the roof as backup. Around 1950 the fog signal was moved to a brick building that also housed a radio beacon. Both buildings remain today. In 1969 the air horn was replaced with an electric diaphone signal, which could be heard for two miles. The radio beacon has been discontinued, and on August 16, 1986 the lighthouse was officially automated. With computer monitoring equipment installed, today the lighthouse is managed remotely from Baltimore, MD. 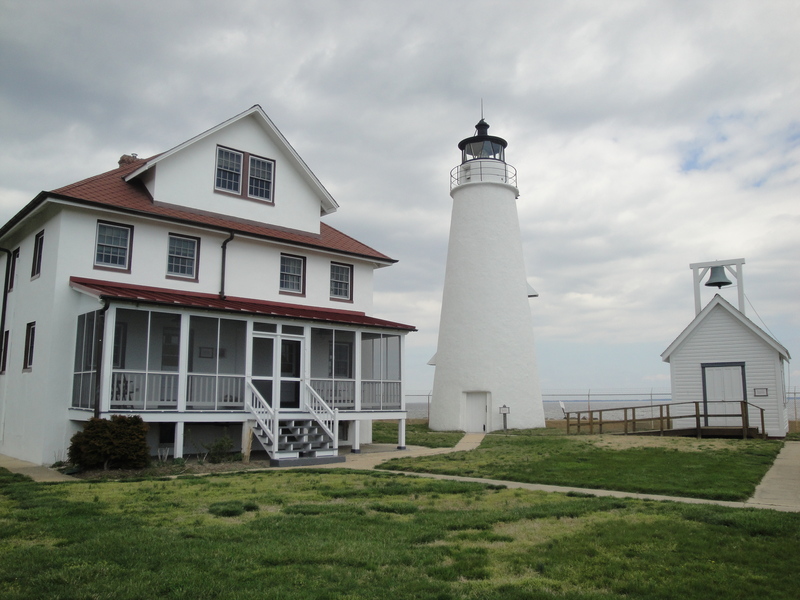 In September 2000 the light station was turned over to Calvert County and is maintained by the Calvert Marine Museum. The U.S. Coast Guard is still responsible for the optic while the museum maintains the structure and grounds. Tours began in 2002 and in 2012 work was completed on the duplex and the facility is now available as rental units. The light remains an active aid to navigation and is the oldest continuously operating lighthouse on the Chesapeake Bay. The light and keeper’s house and the other buildings on the site were listed on the National Register of Historic Places in 1973. Learn more about this wonderful light at The Calvert Maritime Museum. From Richmond, VA: Take U.S. route 301 north into Maryland, then State Route 234 east to State Route 5, south on State Route 5 passing Leonardtown, left on State Route 4 across the Thomas Johnson Bridge (lower Patuxent River Bridge) to State Route 2 at east end of the bridge, then right approximately 500 feet to the museum.